DIE Lunæ, videlicet, 11 Julii. Letter from the E. of Warwick to the Speaker. and for the Lords to concur in the following Orders. Message to the H. C. to communicate Lord Warwick's Letter at the Conference. French Ambassador will acquaint his Master with the Substance of Sir Tho. Roe's Letter. Order for 1500l. to the E. of Warwick. Order for 200l. Proposition-money towards raising Men for Hull. Order for 1000l. for Languard Fort. Order for Ammunition going to the North, to be stayed. Conference about a further Impeachment against the Lord Mayor, reported. Lord Chief Baron, and Mr. Baron Weston, Leave to be absent. Message to the H. C. to fit P. M.
E. Warwick's Letters about Ammunition on board the Concord, of Dartmouth. Another Letter from him, that The Lyon was come in from Holland; that he had confined Captain Fox; and the Crew had submitted to the Parliament. Sheriff of Berks to apprehend Rioters in Windsor Forest. Sheriff of Cornwall to publish the Declaration against the Commission of Array. Answer; and about the Lord Mayor. Justice Mallet to go the Circuit. Message from the H. C. about Earl Rivers's executing the Commission of Array for Cheshire; concerning the Lord Mayor; and Information about the Powder lately taken. Order to attach any one who shall put in Execution the Commission of Array for Cornwall. Report of the Conference about a Locum Tenens during the Lord Mayor's Confinement. Ship lately stopped with Powder, to be released. E. Rivers and sir Tho. Aston about executing the Commission of Array for Cheshire. Sir Tho. Aston sent for by the H. C.
E. Rivers sent for, as a Delinquent. Col. Butler committed to the Custody of Alderman Sir George Whitmore. Harwood and Somers, Brag and Rosewell, Nutwell and Gisborough. Lady Hastings and Mr. Poulton. Message to the H. C. that Order is sent to discharge the Vessel loaded with Powder. Sir Jo. Wollaston to issue 10,000 l. according to the Directions of the Committee of Safety. Declaration to be sent to the North. and with Instructions for the Leicestershire Committee. Message from the H. C. with an Order concerning Subscription. Declaration for Satisfaction of those that have received Prejudice by opening the Sluices at Hull. The Declaration sent to the North. Order concerning Subscription in Essex. E. Rivers's Warrant to apprehend a High Constable, for executing the Militia, in Opposition to the Commission of Array. Order to authorize Lords Lieutenants to train Voluntiers. Ordered, To be communicated to the House of Commons, at a Conference. 1. To desire a present Conference, concerning a further Impeachment against the Lord Mayor of London. 1. For Payment of Fifteen Hundred Pounds to the Earl of Warwick. 2. For Two Hundred Pounds to be impressed for the Captains that go to Hull, with Two Thousand (fn. 2) Men. 3. For Payment of One Thousand Pounds to the Earl of Warwicke, for Landgor Fort. 4. An Order for Indemnity to the Mayor of North'ton for staying Horses. 5. To desire Expedition in the Order concerning Tristram Whetcombe. This House will take it into Consideration. That their Lordships will give a present Conference, in the Painted Chamber, and do agree to all their Orders; and concerning the Order of Whitcombe, this House will (fn. 3) take it into their Consideration, and return a speedy Answer. To desire, at this Conference, their Lordships may communicate unto them a Letter received from the Earl of Warwicke. The Earl of Holland reported, "That his Lordship and the Lord Feilding have acquainted the French Ambassador of the Substance of Sir Tho. Rowe's Letter; and he will give his Master an Account of it, which he hopes will be very satisfactory; and the Ambassador returns the Parliament Thanks, in his Master's Name and his own." Ordered, That this be communicated to the House of Commons at a Conference. "Ordered, That the Treasurers of the Navy shall pay the Fifteen Hundred Pounds, according to the former Order, to the Earl of Warwicke, or his Assigns; and that the Lords Concurrence be desired herein." Ordered, That this House agrees with the House of Commons, in the Order. 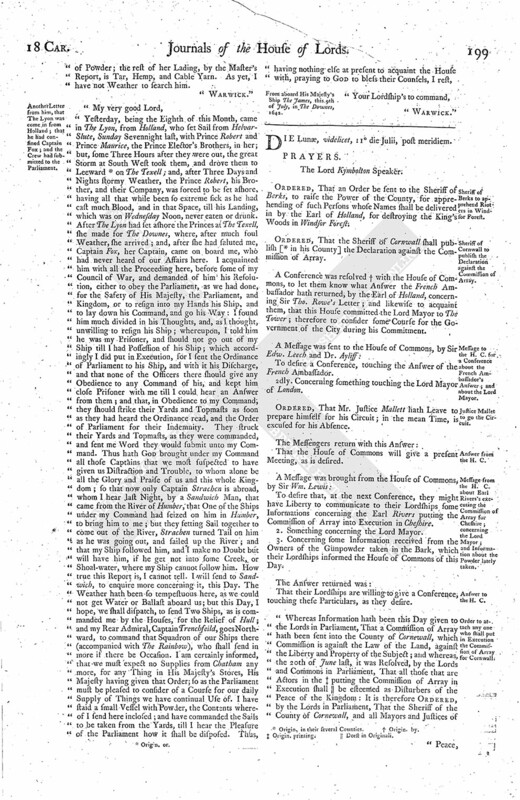 "Ordered, That the Treasurers for the Money that is come in upon the Propositions for bringing in of Plate, shall pay into the Committee's Hands, appointed to take Care for the Defence of the Kingdom, Two Hundred Pounds, upon Accompt, to be impressed to the Captains that are to raise the Two Thousand Men for Hull; and that the Lords Concurrence herein be desired." "It is this Day Ordered, by the Lords and Commons in Parliament, That a Thousand Pounds, for the Succour of Langor Fort, shall be forthwith paid unto the Earl of Warwicke, or his Assigns, out of the Money that is come in upon the Bill of Four Hundred Thousand Pounds; and the former Order of the 6th of July, for the receiving of the said Thousand Pounds out of the Contribution-money, to be canceled." 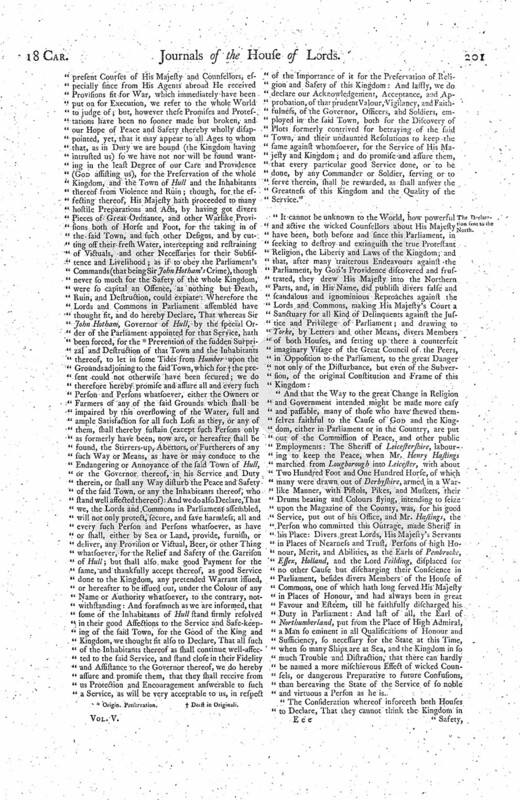 "Whereas there issued an Order from the House of Lords in Parliament, upon the 15th Day of June last past, requiring a strict Search and Examination to be made, by the Justices of Peace, Mayors, Bailiffs, Constables, and other His Majesty's Officers, inhabiting or near adjoining to all the Northern Roads, for the stopping and staying of all Arms, Ammunition, Powder, Light Horses, or Horses for Service in the Wars, and Great Saddles, that are or shall be carried to the North Parts of England, but by Privity and Direction of one or both Houses of Parliament; and that the said Officers should stay them accordingly, and speedily give Information thereof to one of the Houses of Parliament: And whereas the Mayor of the Town of North'ton, in Pursuance of the said Order, at several Times, did stay Two War Horses, and give Notice thereof to the House of Commons, and, (fn. 3) by Order of that House, doth still detain them; which his Obedience to their said Orders, both Houses do very (fn. 3) well approve; nevertheless, for his so doing, Information is given that the said Mayor is served with a pretended Warrant, under His Majesty's Hand, by one Robert Taverner, a Messenger, who is thereby commanded to bring the said Mayor before His Majesty or His Privy Council: It is Ordered, by the Lords and Commons in Parliament, That the said Mayor do not depart the Town of North'ton; and that the Corporation of North'ton do take Care not to suffer him to depart the same: And it is further (fn. 4) Ordered, That the said Taverner, who hath endeavoured to apprehend the said Mayor, shall be (fn. 5) forthwith summoned to come, in safe Custody, to attend the said Houses." The Lord Mayor was brought in as a Delinquent, and the Speaker told him, "That this House hath received a further Impeachment against him from the House of Commons." And then the Articles were read to him. The Lord Mayor desired their Lordships to give him some Time, to answer by Counsel. Ordered, That the Lord Mayor of London shall put in his Answer to this Impeachment by To-morrow Sevennight; and that he shall be assigned the same Counsel as before; and they may come to The Tower to him, to advise him therein. Next, the Lord Mayor was asked why he refused, on Saturday last, at the Common Council, to put the Question, and protested against it; the Question being concerning the Storing of the Magazine that came from Hull, according to the Order of both Houses of Parliament. He answered, "That he thought it not fit to lay so much Powder in the City, being dangerous; there being much there already, and they cannot find Room for that." He withdrew; and it is Resolved, upon the Question, That the Lord Mayor, for his Contempt to this House, shall be committed to The Tower of London. Ordered, That the Lord Mayor of London shall stand committed to The Tower of London; and that the Lieutenant of The Tower shall take Care that he be kept there in safe Custody until the Pleasure of this House be further known; and this he is to do at his Peril. The Lord Mayor was called in, and was told by the Speaker, "That, for his Contempt to this House, the Lords have committed him to The Tower; and that he shall put in his Answer to this Impeachment on Tuesday come Sevennight; and that he shall be allowed the same Counsel as before, who may come to him to The Tower, to advise with him about his Answer." Ordered, That the Lord Chief Baron and Mr. Baron Weston have Leave to go to their own Houses until the Beginning of Michaelmas Term (fn. 6) next. To let them know, that this House intends to fit this Afternoon, at Four a Clock. Ordered, To have a Conference with the House of Commons this Afternoon, concerning the safe Guarding of The Tower, and concerning the Answer of the French Ambassador. "I find, by a Letter from Mr. Samuell Angier, a Merchant of Amsterdam, to Mr. Joseph Cubitt, Master of The Concord, of Dartmouth, That there is in the said Vessel, consigned to Mr. Thomas Ford, of Exeter, Ninety Half Barrels of Powder, and Five Whole Barrels more; for Accompt of Mr. Mallachy Pyne, Servant to Mr. Ford, Six Hundred Pounds of Powder; and for Accompt of the Master, One Thousand Pounds of Powder; the rest of her Lading, by the Master's Report, is Tar, Hemp, and Cable Yarn. As yet, I have not Weather to search him. From aboard His Majesty's Ship The James, this 9th of July, in The Downes, 1642. Ordered, That an Order be sent to the Sheriff of Berks, to raise the Power of the County, for apprehending of such Persons whose Names shall be delivered in by the Earl of Holland, for destroying the King's Woods in Windsor Forest. Ordered, That the Sheriff of Cornwall shall publish [ (fn. 8) in his County] the Declaration against the Commission of Array. A Conference was resolved (fn. 9) with the House of Commons, to let them know what Answer the French Ambassador hath returned, by the Earl of Holland, concerning Sir Tho. Rowe's Letter; and likewise to acquaint them, that this House committed the Lord Mayor to The Tower; therefore to consider some Course for the Government of the City during his Commitment. To desire a Conference, touching the Answer of the French Ambassador. 2dly. Concerning something touching the Lord Mayor of London. Ordered, That Mr. Justice Mallett hath Leave to prepare himself for his Circuit; in the mean Time, is excused for his Absence. To desire that, at the next Conference, they might have Liberty to communicate to their Lordships some Informations concerning the Earl Rivers putting the Commission of Array into Execution in Cheshire. 2. Something concerning the Lord Mayor. 3. Concerning some Information received from the Owners of the Gunpowder taken in the Bark, which their Lordships informed the House of Commons of this Day. That their Lordships are willing to give a Conference, touching these Particulars, as they desire. 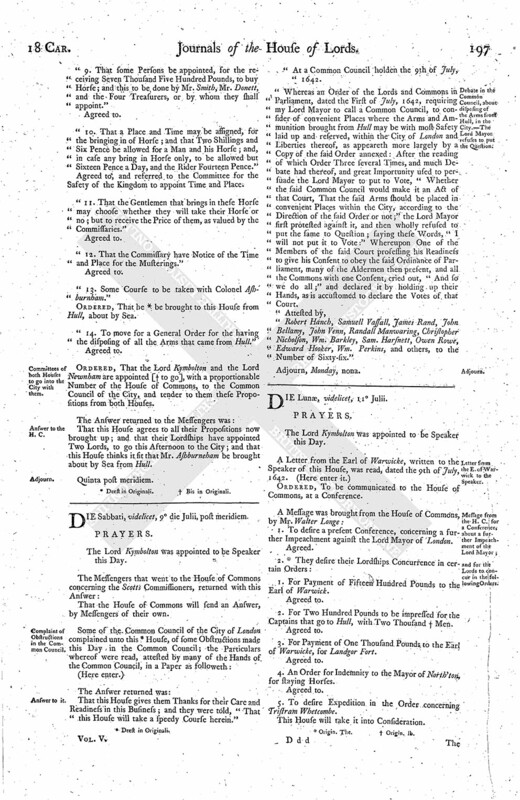 "Whereas Information hath been this Day given to the Lords in Parliament, That a Commission of Array hath been sent into the County of Cornewall, which Commission is against the Law of the Land, against the Liberty and Property of the Subject; and whereas, the 20th of June last, it was Resolved, by the Lords and Commons in Parliament, That all those that are Actors in the (fn. 10) putting the Commission of Array in Execution shall (fn. 11) be esteemed as Disturbers of the Peace of the Kingdom: It is therefore Ordered, by the Lords in Parliament, That the Sheriff of the County of Cornewall, and all Mayors and Justices of Peace, and the Hundred and Petty Constables, do arrest the Bodies of all such Persons as shall attempt to put the Commission of Array in Execution, either by sending forth their Warrants in Pursuance of the said Commission, or who shall by any other Way attempt to do any Thing by virtue of the said Commission; and the said Sheriff and Justices of the Peace are further required to publish the Declarations of the Lords and Commons in Parliament, concerning the said Commission of Array, at the Public Sessions in each Division of the said County; and likewise all Mayors within their several Corporations, forthwith, upon Notice hereof, to publish the same in their said Corporations, on the next Market-day: And they do hereby further charge and command all Persons whatsoever, not to give any Obedience to (fn. 12) the said Commission of Array, or to any Command issuing thereupon, as they tender the Preservation of the Peace of this Kingdom, the Laws of the Land, and as they will be accountable for their Neglect herein." The Lord Kymbolton reported the Effect of this Conference: "That Alderman Pennington being sent from the House of Commons to the Lord Mayor, about appointing of a Locum Tenens, he refused to do any Thing therein. Upon this, he went to Sir Nic. Raynton and Sir George Whitmore about it, and they denied it; and then to Sir Henry Garraway, and he excused it. The House of Commons desires that they may be sent for." Ordered, They attend this House To-morrow. "2. Mr. Rous delivered, That he hath examined the Captain and Master of the Ship laden with Powder, which the Earl of Warwicke hath taken; and they find that the said Ship belongs to a Merchant of Exeter, who is a very honest Man; therefore the House of Commons think it fit that the said Ship be released, by Warrant from the Earl of Warwicke." Ordered, That the said Ship be released by the Earl of Warwicke. "The House of Commons have sent for Sir Tho. Aston; and the House of Commons desires their Lordships would send for the Earl Rivers." Ordered, That the Earl Rivers shall be sent for as a Delinquent, and the Earl of North'ton and others. Upon the humble Desire of the Lord Mayor of London, to order the disposing of Colonel Butler, since he is not at his own House; Ordered, That the said Colonel Butler shall be committed to the safe Custody of Sir George Whitmore, Knight, an Alderman of the City of London, in the same Manner as he was with the Lord Mayor. Ordered, That Errors shall be assigned, in the Writs of Error depending in this House, between Harwood and Somers, and Brag and Rosewell, and Nutwell and Gisborow, this Day Fortnight. Upon the Petition of the Lady Hastings, against the Heir and Executor of Francis Poulton, Esquire; it is Ordered, That the said Heir and Executor shall make Answer to this Petition by To-morrow Sevennight. To let them know, that this House hath Ordered, That the Bark be discharged by the Earl of Warwicke. Ordered, That the Errors shall be assigned by this Day Fortnight, in the Writ of Error between Eales and Covell; or else the Transcript is to be returned. "1. Ordered, by the Lords and Commons in Parliament, That Sir Jo. Wollaston, Knight, &c. Treasurers for the receiving of Money brought in upon the Propositions, shall issue Ten Thousand Pounds, upon Accompt, unto such Persons, and for such Uses, as shall be directed by the Committee of Lords and Commons appointed for the Defence of the Kingdom." Next, was read a Declaration, which is to be sent into the North. (Here enter it.) Some few Amendments were made here; and, being put to the Question, it is Resolved, That this Declaration, with the Amendments, is agreed to by this House. Resolved, upon the Question, That this House agrees with the House of Commons in this Declaration. 4. Next, were read Instructions for the Lord Ruthin and Sir Arthur Haselrigg, Committees for the House of Commons, who are to be sent into Leycestershire. Agreed to, with some small Amendments. That their Lordships do agree to the Order for the Ten Thousand Pounds, and the Declaration for making good the Damage of the Grounds drowned before Hull; and concerning the other Declaration, and the Instructions, this House will send an Answer, by Messengers of their own. To desire their Lordships Concurrence in an Order concerning Subscription; and the House of Commons desires that it may be general throughout England. 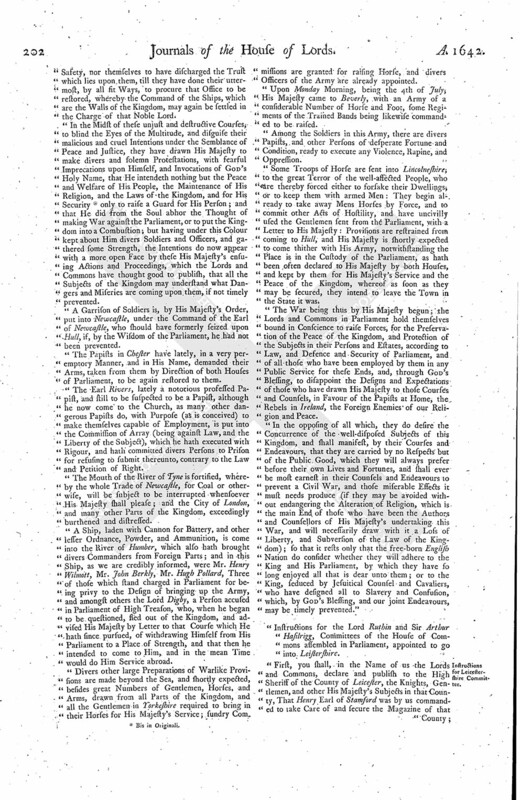 "As in all our Endeavours, since the Parliament began, we intended wholly the Advancement of His Majesty's Honour and Safety, and the Re-gainment of the ancient (though of late Years much invaded) Rights, Laws, and Liberties (being the Birth-rights) of the Subjects of this Land, and settling of the true Protestant Religion (the Glory of our Nation) in Peace and Purity; so did we no less hope for and expect His Majesty's Concurrence in those Particulars, they being the very Foundation of His Majesty's present Honour and Greatness, and the Fountain of prefect and future Bliss to Himself and all His loyal Subjects, which too evidently we see ourselves (by the wicked Counsellors now unmasked about His Majesty) not only deprived of, but instead thereof open War declared and prosecuted against His Majesty's loyal Subjects of Hull, and elsewhere in this Kingdom, far unsuitable to such Declarations of Love and Peace as His Majesty hath frequently promised and published to the Kingdom, and in particular to the County of Yorke, with solemn Protestations that He would not (nor had it entered His Thoughts to) make War against His Parliament; which how agreeable they are to the present Courses of His Majesty and Counsellors, especially since from His Agents abroad He received Provisions fit for War, which immediately have been put on for Execution, we refer to the whole World to judge of; but, however these Promises and Protestations have been no sooner made but broken, and our Hope of Peace and Safety thereby wholly disappointed, yet, that it may appear to all Ages to whom that, as in Duty we are bound (the Kingdom having intrusted us) so we have not nor will be found wanting in the least Degree of our Care and Providence (God assisting us), for the Preservation of the whole Kingdom, and the Town of Hull and the Inhabitants thereof from Violence and Ruin; though, for the effecting thereof, His Majesty hath proceeded to many hostile Preparations and Acts, by having got divers Pieces of Great Ordnance, and other Warlike Provisions both of Horse and Foot, for the taking in of the said Town, and such other Designs, and by cutting off their fresh Water, intercepting and restraining of Victuals, and other Necessaries for their Subsistence and Livelihood; as if to obey the Parliament's Commands (that being Sir John Hotham's Crime), though never so much for the Safety of the whole Kingdom, were so capital an Offence, as nothing but Death, Ruin, and Destruction, could expiate: Wherefore the Lords and Commons in Parliament assembled have thought fit, and do hereby Declare, That whereas Sir John Hotham, Governor of Hull by the special Order of the Parliament appointed for that Service, hath been forced, for the (fn. 14) Prevention of the sudden Surprizal and Destruction of that Town and the Inhabitants thereof, to let in some Tides from Humber upon the Grounds adjoining to the said Town, which for (fn. 15) the present could not otherwise have been secured; we do therefore hereby promise and assure all and every such Person and Persons whatsoever, either the Owners or Farmers of any of the said Grounds which shall be impaired by this overflowing of the Water, full and ample Satisfaction for all such Loss as they, or any of them, shall thereby sustain (except such Persons only as formerly have been, now are, or hereafter shall be found, the Stirrers-up, Abettors, or Furtherers of any such Way or Means, as have or may conduce to the Endangering or Annoyance of the said Town of Hull, or the Governor thereof, in his Service and Duty therein, or shall any Way disturb the Peace and Safety of the said Town, or any the Inhabitants thereof, who stand well affected thereof): And we do also Declare, That we, the Lords and Commons in Parliament assembled, will not only protect, secure, and save harmless, all and every such Person and Persons whatsoever, as have or shall, either by Sea or Land, provide, furnish, or deliver, any Provision or Victual, Beer, or other Thing whatsoever, for the Relief and Safety of the Garrison of Hull; but shall also make good Payment for the same, and thankfully accept thereof, as good Service done to the Kingdom, any pretended Warrant issued, or hereafter to be issued out, under the Colour of any Name or Authority whatsoever, to the contrary, notwithstanding: And forasmuch as we are informed, that some of the Inhabitants of Hull stand firmly resolved in their good Affections to the Service and Safe-keeping of the said Town, for the Good of the King and Kingdom, we thought fit also to Declare, That all such of the Inhabitants thereof as shall continue well-affected to the said Service, and stand close in their Fidelity and Assistance to the Governor thereof, we do hereby assure and promise them, that they shall receive from us Protection and Encouragement answerable to such a Service, as will be very acceptable to us, in respect of the Importance of it for the Preservation of Religion and Safety of this Kingdom: And lastly, we do declare our Acknowledgement, Acceptance, and Approbation, of that prudent Valour, Vigilancy, and Faithfulness, of the Governor, Officers, and Soldiers, employed in the said Town, both for the Discovery of Plots formerly contrived for betraying of the said Town, and their undaunted Resolutions to keep the same against whomsoever, for the Service of His Majesty and Kingdom; and do promise and assure them, that every particular good Service done, or to be done, by any Commander or Soldier, serving or to serve therein, shall be rewarded, as shall answer the Greatness of this Kingdom and the Quality of the Service. And that the Way to the great Change in Religion and Government intended might be made more easy and passable, many of those who have shewed themselves faithful to the Cause of God and the Kingdom, either in Parliament or in the Country, are put out of the Commission of Peace, and other public Employments: The Sheriff of Leicestershire, labouring to keep the Peace, when Mr. Henry Hastings marched from Lougborough into Leicester, with about Two Hundred Foot and One Hundred Horse, of which many were drawn out of Derbyshire, armed in a Warlike Manner, with Pistols, Pikes, and Muskets, their Drums beating and Colours flying, intending to seize upon the Magazine of the County, was, for his good Service, put out of his Office, and Mr. Hastings, the Person who committed this Outrage, made Sheriff in his Place: Divers great Lords, His Majesty's Servants in Places of Nearness and Trust, Persons of high Honour, Merit, and Abilities, as the Earls of Pembrooke, Essex, Holland, and the Lord Feilding, displaced for no other Cause but discharging their Conscience in Parliament, besides divers Members of the House of Commons, one of which hath long served His Majesty in Places of Honour, and had always been in great Favour and Esteem, till he faithfully discharged his Duty in Parliament: And last of all, the Earl of Northumberland, put from the Place of High Admiral, a Man so eminent in all Qualifications of Honour and Sufficiency, so necessary for the State at this Time, when so many Ships are at Sea, and the Kingdom in so much Trouble and Distraction, that there can hardly be named a more mischievous Effect of wicked Counsels, or dangerous Preparative to future Confusions, than bereaving the State of the Service of so noble and virtuous a Person as he is. The Consideration whereof inforceth both Houses to Declare, That they cannot think the Kingdom in Safety, nor themselves to have discharged the Trust which lies upon them, till they have done their uttermost, by all fit Ways, to procure that Office to be restored, whereby the Command of the Ships, which are the Walls of the Kingdom, may again be settled in the Charge of that Noble Lord. In the Midst of these unjust and destructive Courses, to blind the Eyes of the Multitude, and disguise their malicious and cruel Intentions under the Semblance of Peace and Justice, they have drawn His Majesty to make divers and solemn Protestations, with fearful Imprecations upon Himself, and Invocations of God's Holy Name, that He intendeth nothing but the Peace and Welfare of His People, the Maintenance of His Religion, and the Laws of the Kingdom, and for His Security (fn. 16) only to raise a Guard for His Person; and that He did from the Soul abhor the Thought of making War against the Parliament, or to put the Kingdom into a Combustion; but having under this Colour kept about Him divers Soldiers and Officers, and gathered some Strength, the Intentions do now appear with a more open Face by these His Majesty's ensuing Actions and Proceedings, which the Lords and Commons have thought good to publish, that all the Subjects of the Kingdom may understand what Dangers and Miseries are coming upon them, if not timely prevented. A Garrison of Soldiers is, by His Majesty's Order, put into Newcastle, under the Command of the Earl of Newcastle, who should have formerly seized upon Hull, if, by the Wisdom of the Parliament, he had not been prevented. The Papists in Chester have lately, in a very peremptory Manner, and in His Name, demanded their Arms, taken from them by Direction of both Houses of Parliament, to be again restored to them. The Earl Rivers, lately a notorious professed Papist, and still to be suspected to be a Papist, although he now come to the Church, as many other dangerous Papists do, with Purpose (as is conceived) to make themselves capable of Employment, is put into the Commission of Array (being against Law, and the Liberty of the Subject), which he hath executed with Rigour, and hath committed divers Persons to Prison for refusing to submit thereunto, contrary to the Law and Petition of Right. The Mouth of the River of Tyne is fortified, whereby the whole Trade of Newcastle, for Coal or otherwise, will be subject to be interrupted whensoever His Majesty shall please; and the City of London, and many other Parts of the Kingdom, exceedingly burthened and distressed. A Ship, laden with Cannon for Battery, and other lesser Ordnance, Powder, and Ammunition, is come into the River of Humber, which also hath brought divers Commanders from Foreign Parts; and in this Ship, as we are credibly informed, were Mr. Henry Wilmott, Mr. John Berkly, Mr. Hugh Pollard, Three of those which stand charged in Parliament for being privy to the Design of bringing up the Army, and amongst others the Lord Digby, a Person accused in Parliament of High Treason, who, when he began to be questioned, fled out of the Kingdom, and advised His Majesty by Letter to that Course which He hath since pursued, of withdrawing Himself from His Parliament to a Place of Strength, and that then he intended to come to Him, and in the mean Time would do Him Service abroad. Divers other large Preparations of Warlike Provisions are made beyond the Sea, and shortly expected, besides great Numbers of Gentlemen, Horses, and Arms, drawn from all Parts of the Kingdom, and all the Gentlemen in Yorkeshire required to bring in their Horses for His Majesty's Service; sundry Commissions are granted for raising Horse, and divers Officers of the Army are already appointed. Upon Monday Morning, being the 4th of July, His Majesty came to Beverly, with an Army of a considerable Number of Horse and Foot, some Regiments of the Trained Bands being likewise commanded to be raised. Among the Soldiers in this Army, there are divers Papists, and other Persons of desperate Fortune and Condition, ready to execute any Violence, Rapine, and Oppression. Some Troops of Horse are sent into Lincolneshire; to the great Terror of the well-affected People, who are thereby forced either to forsake their Dwellings, or to keep them with armed Men: They begin already to take away Mens Horses by Force, and to commit other Acts of Hostility, and have uncivilly used the Gentlemen sent from the Parliament, with a Letter to His Majesty: Provisions are restrained from coming to Hull, and His Majesty is shortly expected to come thither with His Army, notwithstanding the Place is in the Custody of the Parliament, as hath been often declared to His Majesty by both Houses, and kept by them for His Majesty's Service and the Peace of the Kingdom, whereof as soon as they may be secured, they intend to leave the Town in the State it was. The War being thus by His Majesty begun; the Lords and Commons in Parliament hold themselves bound in Conscience to raise Forces, for the Preservation of the Peace of the Kingdom, and Protection of the Subjects in their Persons and Estates, according to Law, and Defence and Security of Parliament, and of all those who have been employed by them in any Public Service for these Ends, and, through God's Blessing, to disappoint the Designs and Expectations of those who have drawn His Majesty to those Courses and Counsels, in Favour of the Papists at Home, the Rebels in Ireland, the Foreign Enemies of our Religion and Peace. In the opposing of all which, they do desire the Concurrence of the well-disposed Subjects of this Kingdom, and shall manifest, by their Courses and Endeavours, that they are carried by no Respects but of the Public Good, which they will always prefer before their own Lives and Fortunes, and shall ever be most earnest in their Counsels and Endeavours to prevent a Civil War, and those miserable Effects it must needs produce (if they may be avoided without endangering the Alteration of Religion, which is the main End of those who have been the Authors and Counsellors of His Majesty's undertaking this War, and will necessarily draw with it a Loss of Liberty, and Subversion of the Law of the Kingdom); so that it rests only that the free-born English Nation do consider whether they will adhere to the King and His Parliament, by which they have so long enjoyed all that is dear unto them; or to the King, seduced by Jesuitical Counsel and Cavaliers, who have designed all to Slavery and Confusion, which, by God's Blessing, and our joint Endeavours, may be timely prevented." 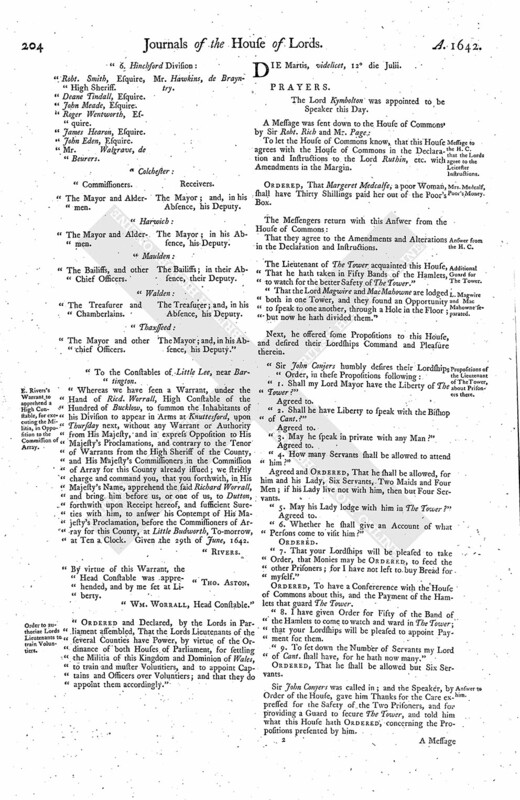 Instructions for the Lord Ruthin and Sir Arthur Hasilrigg, Committees of the House of Commons assembled in Parliament, appointed to go into Leistershire. First, you shall, in the Name of us the Lords and Commons, declare and publish to the High Sheriff of the County of Leicester, the Knights, Gentlemen, and other His Majesty's Subjects in that County, That Henry Earl of Stamford was by us commanded to take Care of and secure the Magazine of that County; and what hath (fn. 17) been therein done, by him and his Adherents, hath been necessary, in Pursuance of our Order, and is by us avowed and approved of, as warranted by the Authority of both Houses of Parliament. 2. You shall assist the Lord Lieutenant, Henry Earl Stamford, with your best Counsel and Advice, and by all other Means, safely to dispose or keep the Magazine, for the Peace and Security of the County, in such Manner as to you shall seem most requisite. 3. You shall take Care that no Forces be raised, to disturb the Peace of the said County; and in case any be raised, you shall, in the Name of both Houses of Parliament, command them to disperse themselves; and if they refuse so to do, you are hereby authorized to draw together the Trained Bands, and others, for to defend and preserve the Peace of the County; and, if Necessity require it, you may repel Force with Force, for the Preservation of the Peace of the Kingdom. 4. If you shall find any disaffected Persons raising any Parties or Factions against the Parliament, or spreading any Scandals or Aspersions upon their Proceedings, like to disturb the Peace of the County, you shall cause all such Persons, upon good Proof of their Misdemeanors, to be arrested, and sent up to answer such their Offences, as to Law and Justice shall appertain. 5. You shall take Care that such Resolutions and Orders of both Houses as have been, or shall be, sent down, be put in Execution; and shall require the Sheriff, Deputy Lieutenants, and Justices of Peace, and all other His Majesty's Subjects, to be aiding and assisting unto you, for that Purpose. 6. You shall endeavour to clear the Proceedings of Parliament from all Imputations and Aspersions; and you shall give all due and fit Encouragement to such as you find ready and serviceable to the King and Parliament; letting them understand, that, wherein they are obedient to the Command of Parliament, both Houses will protect them. 7. You shall inform His Majesty's Subjects, that they are neither to follow the High Sheriff, nor to observe his Commands, concerning the Extent of the Commission of Array, nor other Case but where the Law gives him his Power. 8. You are likewise to put in Execution the Ordinance concerning the Militia. "9. You shall observe and execute all such further Directions and Instructions as you shall from Time to Time receive from both Houses of Parliament." Whereas the Deputy Lieutenants for the County of Essex, according to the Order of both Houses of Parliament, have now presented the Names of such Gentlemen, hereafter named, within the several Divisions and Corporations of that County, as (fn. 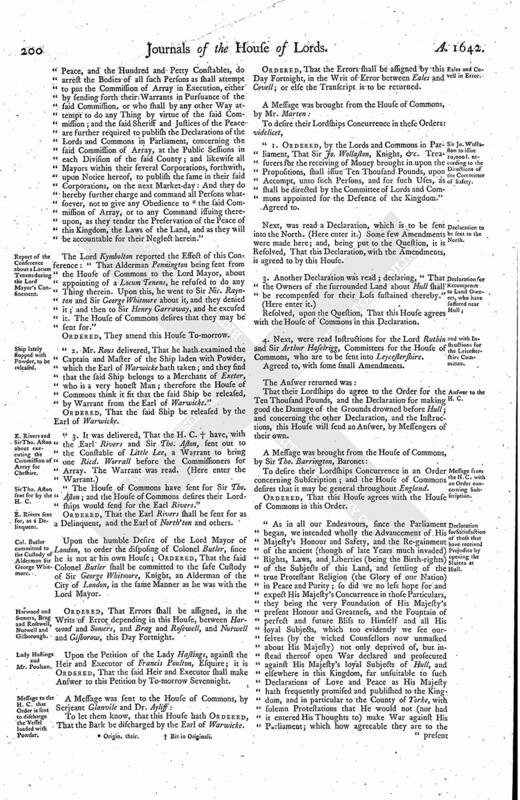 18) they conceive are well-affected to the Parliament, and willing to advance the Service of raising Horses, Horsemen, and Arms, Money, and Plate, for the Defence of King, Parliament, and Kingdom: It is therefore Declared, by both Houses of Parliament, That the Persons so nominated to be Commissioners as aforesaid are approved of; and they, or any Two of them, are hereby authorized to put the Propositions touching that Service in Execution in all Points, according to the said Propositions and Orders of Instructions; and the Persons so nominated to be Receivers are likewise approved of; and they, or any One of them, within (fn. 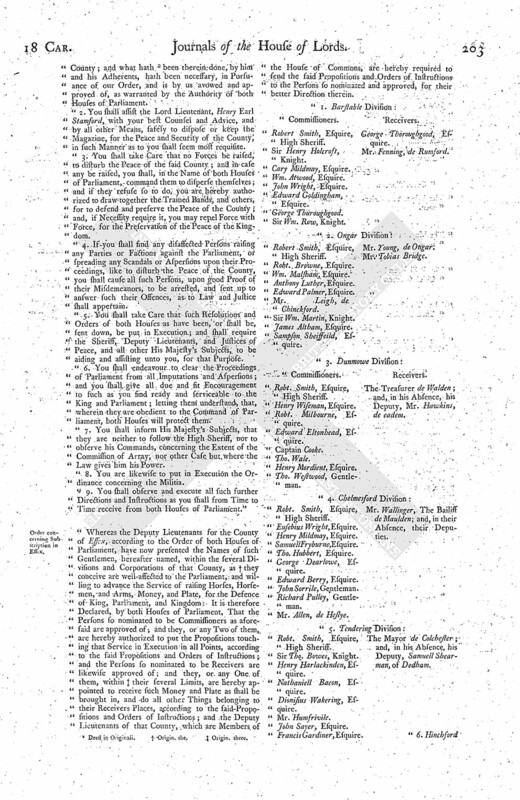 19) their several Limits, are hereby appointed to receive such Money and Plate as shall be brought in, and do all other Things belonging to their Receivers Places, according to the said-Propositions and Orders of Instructions; and the Deputy Lieutenants of that County, which are Members of the House of Commons, are hereby required to send the said Propositions and Orders of Instructions to the Persons so nominated and approved, for their better Direction therein. Robert Smith, Esquire, High Sheriff. Sir Wm. Row, Knight. Receivers. Sampson Sheiffeild, Esquire. Mr. Young, de Ongar. Robt. Smith, Esquire, High Sheriff. The Treasurer de Walden; and, in his Absence, his Deputy, Mr. Hawkins, de eadem. Mr. Allen, de Heslye. Mr. Wallinger, The Bailiff de Maulden; and, in their Absence, their Deputies. Francis Gardiner, Esquire. The Mayor de Colchester; and, in his Absence, his Deputy, Samuell Shearman, of Dedham. "Robt. Smith, Esquire, High Sheriff. Mr. Walgrave, de Beurers. Mr. Hawkins, de Brayntry. The Mayor and Aldermen. Receivers. The Mayor; and, in his Absence, his Deputy. The Mayor and Aldermen. The Mayor; in his Absence, his Deputy. The Bailiffs, and other Chief Officers. The Bailiffs; in their Absence, their Deputy. The Treasurer and Chamberlains. The Treasurer; and, in his Absence, his Deputy. The Mayor and other chief Officers. The Mayor; and, in his Absence, his Deputy." To the Constables of Little Lee, near Bartington. Whereas we have seen a Warrant, under the Hand of Ricd. Worrall, High Constable of the Hundred of Bucklow, to summon the Inhabitants of his Division to appear in Arms at Knuttesford, upon Thursday next, without any Warrant or Authority from His Majesty, and in express Opposition to His Majesty's Proclamations, and contrary to the Tenor of Warrants from the High Sheriff of the County, and His Majesty's Commissioners in the Commission of Array for this County already issued; we strictly charge and command you, that you forthwith, in His Majesty's Name, apprehend the said Richard Worrall, and bring him before us, or one of us, to Dutton, forthwith upon Receipt hereof, and sufficient Sureties with him, to answer his Contempt of His Majesty's Proclamation, before the Commissioners of Array for this County, at Little Budworth, To-morrow, at Ten a Clock. Given the 29th of June, 1642. "By virtue of this Warrant, the Head Constable was apprehended, and by me set at Liberty. 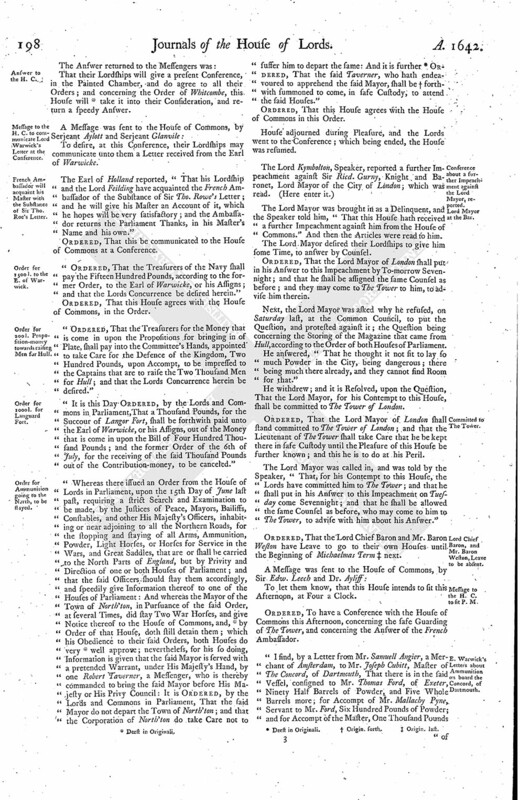 "Ordered and Declared, by the Lords in Parliament assembled, That the Lords Lieutenants of the several Counties have Power, by virtue of the Ordinance of both Houses of Parliament, for settling the Militia of this Kingdom and Dominion of Wales, to train and muster Voluntiers, and to appoint Captains and Officers over Voluntiers; and that they do appoint them accordingly." 8. Origin. in their several Counties.